“O Allah, Shower Your Peace come upon Muhammad and the family of Muhammad, as you have brought peace to Ibrahim and his family. Truly, You are Praiseworthy and Glorious. O Allah, Shower your blessing upon Muhammad and the family of Muhammad, as you have blessed Ibrahim and his family. Truly, You are Praiseworthy and Glorious”. Iam Satisfied with Allâh as My Rabb and Cherisher,Iam Satisfied With Islam as My Din(religion) and I am satisfied with Muhammad as a Rasulallah (Messenger)sallallahu alaihi was salam) I seek Protection with ALLAH! With the Glorious and Noble Face of ALLAH! With the Complete and Perfect words of ALLAH! With the Exalted Attributes of ALLAH! From the Punishment of Hell; From chastisement in the Grave; From the Trial of Life and Death; From the Mischief of the dajjal. There is no power nor strength with (anyone) save Allah. ALLAH is Good and Only accept that which is Good. ALLAH is the Truth and only accept that which True. ALLAH is Pure and only accept that which is Pure. Ya ALLAH! ALL the praises are for You,You are the Holder of the Heavens and the Earth, And whatever is in them. Ya ALLAH! All praises are for You; You are are the Substaner of the Heavens and the Earth And whatever is in them. Ya ALLAH! All the praises are for you;You have the Possession of the Heavens and the Earth and whatever is in them. Ya ALLAH! All the praises are for You; You are Light(Nur) of the Heavens and Earth And whatever is in them. Ya ALLAH! All praises are for You; You are the King of the Heavens and the Earth And whatever is in them. Ya ALLAH! All praises are for You; You are the Truth and Your Promise is the Truth, And Your word is the Truth and the Meeting with You is true, And Parardise is True And Hell is true and All the Prophets(peace be upon them) are true; And Muhammad Rasulallah(sallallahu alayhi wa salam) is true,And the Day of Resurrection is True. Ya ALLAH! You have promise and Your promise is the truth,Ya ALLAH! You have promise and Your words is the truth, Ya ALLAH! You have promise and You are the Truth!. the first and the most important is ReEducation of the Muslim World, Islam emerged in the barren Arabian land, which was both culturally and socially backward,the age of Ignorance. Thus education was put forward as the lamp to illumine the darkness in that age. In Qur’an, the word, ‘Ilm is used, which means knowledge. It is said that Rasulallah(sallallahu alayhi wa salam) asked Muslims to “Acquire knowledge from cradle to grave.” The acquisition of knowledge and learning, both religious and scientific is considered an act of religious merit in Islam. The Sahabah were encouraged by Rasulallah(sallallahu alayhi wa salam)to acquire knowledge wherever it was available. Consequently, the Muslims learned reading and writing with zeal from the very beginning. When Rasulallah(sallallahu alayhi wa salam)asked the Muslims to go to China to acquire knowledge or to get educated from non-Muslim prisoners obviously to learned reading and writing. Not religious teachings. Islam essentially, in several ways, directs acquiring knowledge of the world and modern education. One part of Islamic Educate is Manners and behavior. Adab (good manners) is an integral part of the development of a sound Islamic Society and personality. It is something that one is brought up with, sees around him and thus acquires. The beauty of a civilization is manifested in the values and manners embodied in the interaction of its members. The more dignified the manners, the more stable and vibrant the social fabric of the society. But sadly, we live in times where adab is lacking at all levels of society. We live in an “adab-less” society where parents are disrespected, teachers are not treated with due honor, elders are not given their due rights, and the basic manners of eating, visiting, appearance and conversation are not observed. “It is therefore important for Us the Muslims to learn the basic points of adab that are applicable in everyday situations in a way that was exemplified by Rasulallah(sallallahu alayhi wa salam) sunnah. In the ReEducation of the Muslim world,This Adad(good manner) is designed to empower the muslims in building their Islamic personality through self-improvement in the finer points of Islamic manners. ALLAH (swt) said: “And whoever purifies himself does so for the benefit of his own soul; and the destination (of all)is to ALLAH”Qur’an: Surah Fater, 35:18. A major portion of building the Muslim personality comes from the Islamic fundamental source, al Tazkiyah or the purification of the heart and soul. Through tazkiyah comes spiritual health and morality. The traits of loving of Allah and His Prophets, adorning and practicing the ninety-nine attributes of Allah, applying the virtues of compassion and mercy, holding one’s brother or sister’s well-being higher than one’s own self, generosity, piousness, trustworthiness and much more are consequent virtues of tazkiyah. The Muslims, with Allah’s permission, will have a deeper awareness and appreciation for proper manners and etiquettes in a variety of everyday situations. The Golden Age of Islam: The Islamic world flourished during the Dark Ages of Europe: by the 13th century, both Africa and India had become great centers of Islamic civilization, and soon after, Muslim societies were established in the Malay-Indonesian world while Chinese Muslims flourished throughout China. Islam therefore is The religion for all people from whatever part of the world the people came from or background they might be: Islamic civilization is based on a unity which stands completely against any racial or ethnic discrimination. Such major people as the Arabs, Persians, Turks, Africans, Indians, Chinese and Malays in addition to countless smaller units embraced Islam and contributed to the building of Islamic civilization. Islam was not opposed to learning from the earlier civilizations and incorporating their science, learning, and culture into its own world view. Each people that embraced Islam made its contribution to the one Islamic civilization to which everyone belonged. The global civilization created by Islam also succeeded in activating the Hearts and minds and thoughts of the people who entered its fold. As a result Islam, the Muslims became torch-bearers of science and learning. The Persians, who had manufactured a great civilization before the rise of Islam, produced even more science and learning in the Islamic period than before. The same can be said of the Turks and other peoples who embraced Islam,THIS WAS THE GOLDEN AGE! . The Din of Islam was itself responsible not only for the creation of a world Renaissance , a world civilization in which people of many different backgrounds participated, but it also played a central role in inspiring the Hearts and developing intellectual and cultural life on a scale never seen before. Intellect and observation are the grounds of every flourishing civilization. Thousands of verses of the noble Qur’an are stimulus for inspiring the heart and expanding the mind through observation, study of nature and contemplation. The first word revealed to Muhammad Rasulallah(sallallahu alayhi wa salam) was “read”. This word helps open the eyes of the believers for examination and study in all fields of matter and knowledge. Furthermore, one comes across hundreds of verses in the Qur’an with inquisitive style enticing the Muslim people to enlarge their scope to think, calculate and come up with better ways to improve the quality of life. Here are some examples: “Are the blind equal with those who see? Or is the depth of the darkness equal with the light?” Qur’an, 6:50. “Say: go through the earth and see what has been the end of those guilty of sin.” Qur’an, 27:69. “Say: travel through the earth and see how ALLAH did originate creation.” Qur’an, 29:20.”Say: wonder in the heavens and earth for the signs of ALLAH.” Qur’an, 10:101. “It is He Who gives life and death, and to Him is due the alteration of night and day: Will you not then understand.” Qur’an, 23:80. The direct result of this inquisitive approach widens the horizon of exploration and the expansion of thinking and vision. This open observation phenomenon led to the making of the Golden Age and was the cradle to the scientific and academic revolution that led to the Renaissance. A new world beyond violence and beyond conflict, a new world based in peace and in divine surrender, submission to the Will of ALLAH. (This after the Great War!) A Second Golden Age of Islam knowledge, wisdom, understanding and righteous behavior . ALLAH said in the Quran: We created not the heavens, the earth, and all between them, but for just ends. And the hour is surely coming when this will be manifest, so transcend with gracious forgiveness.” –– Surah Al-Hijr (15:85) The way forward is to cross into th new frontier, the Golden Age of Islam! . Islam! The final Din, Final Way of Life, the Final frontier! And the Final Golden Age before day of judgement . And the journey that the Heart and soul takes, Is the journey to seek the Nearness to ALLAH. The Ummah will not be able to make positive change through force of any kind. Rather, positive change will result as a return to righteous behavior and true belief, and this can only be achieved through the Practice of Islam and thought the development of our Spiritual life. In the Second Golden Age of Islam, the Muslim, The believers will be deeply rooted in faith and in the presence of a world deeply in need of reconnection itself with ALLAH its Creator. The original Golden Age of Islam was a time of great progress and enlightenment, and it was fueled by a profound and deep belief and practice of Islam . Although the Muslim Nation now finds itself in a Second Age of Ignorance, its hope in the realization of the Second Golden Age of Islam lies in a return of Good muslim behavior and Practice. and thus a return to the very goal of Islam: To increase the growth and the development of the human beings towards a state of good character and so, through self-purification, the purification of the Soul and Divine Grace, will awaken the consciousness. this entire Universe belong To ALLAH, And to ALLAH it will return! “And indeed it (the Holy Qur’an) is a guide and mercy for the believers.” Qur’an, 27:77. “Seek not mischief in the land, ALLAH does not love mischief makers.” Qur’an, 28:77. “ALLAH commands justice, the doing of good, and liberality to kith and kin, and He forbids all shameful deeds, and injustice and rebellion. “Qur’an, 16:90. “You who believe! Enter absolutely into peace (islam). Do not follow the footsteps of Satan. He is an outright enemy of you.” Qur’an, 2:208. “O humankind! We created you from a single pair of a male and female, and made you into nations and tribes, that you may know and deal with each other in kindness (not that you may despise each other). Verily the most honored of you in the sight of ALLAH (is he who is) the most righteous of you, and ALLAH is Knower, Aware.”Qur’an, 49:13. “And when you judge between people that you judge with justice.” Qur’an 4:58. So Why did Islam spread so fast All over the then known world? The simple answer is that it was ALLAH’s will. And it will be once again ALLAH’s will that there will be a second golden age of Islam ! how to use this blog? Never point your finger at your teacher!!! Why do Muslims fall sick? What are the serious symptoms of sihr and possession? 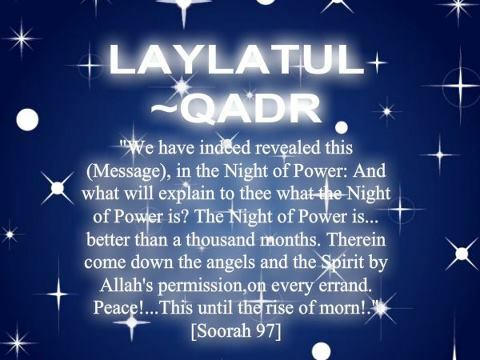 How should a Muslim seek Laila tul-Qadr? What happens if Eid falls on a Friday? What about Jummah prayer?